Credit: Illustration is by Roberto Molar Candanosa and Sergio Dieterich, courtesy of the Carnegie Institution for Science. Washington, DC–The line that separates stars from brown dwarfs may soon be clearer thanks to new work led by Carnegie's Serge Dieterich. Published by the Astrophysical Journal, his team's findings demonstrate that brown dwarfs can be more massive than astronomers previously thought. To shine bright, stars need the energy derived from the fusion of hydrogen atoms deep in their interiors. If too small, hydrogen fusion can't occur, so the object cools, darkens, and turns into something called a brown dwarf. "Understanding the boundary that separates stars from brown dwarfs will improve our understanding of how both form and evolve, as well as whether or not they could possibly host habitable planets," Dieterich explained. Dieterich and colleagues–including Carnegie's Alycia Weinberger, Alan Boss, Jonathan Gagné, Tri Astraatmadja, and Maggie Thompson–demonstrated that brown dwarfs can be more massive than astronomers thought. Dieterich's team observed two brown dwarfs, called Epsilon Indi B and Epsilon Indi C, that are part of a system that also includes a star of medium luminosity–Epsilon Indi A. 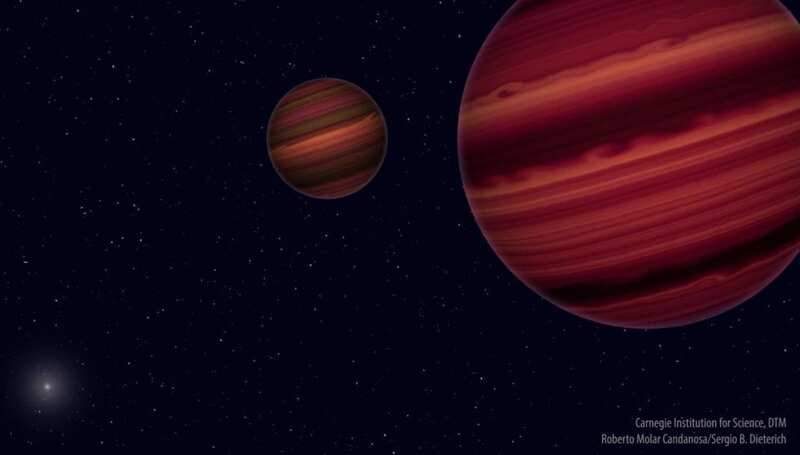 The two brown dwarfs are much too faint to be stars, but their masses are respectively 75 and 70 times that of Jupiter, according to the researchers' findings. The team accomplished these measurements using data from two long-term studies–the Carnegie Astrometric Planet Search at the Carnegie Las Campanas Observatory and the Cerro Tololo Inter-American Observatory Parallax Investigation run by the Research Consortium of Nearby Stars–which allowed them to detect the minute motions of the two brown dwarfs against the background of more-distant stars. To the team's surprise, their findings put Episilon Indi B and C in what was previously considered the stellar realm, even though we know from other observations that they are not stars. "Taken together, our results mean that the existing models need to be revised," Dieterich concluded. "We showed that the heaviest brown dwarfs and the lightest stars may only have slight differences in mass. But despite this, they are destined for different lives–one racing to dim and cool, the other shining for billions of years." "We are interested in whether stars and brown dwarfs always exist in the same proportion to each other in star-forming regions, which could help us understand the overall habitability of our galaxy," she said.